New VW Group CEO Herbert Diess will also oversee r&d and information technology for the company. 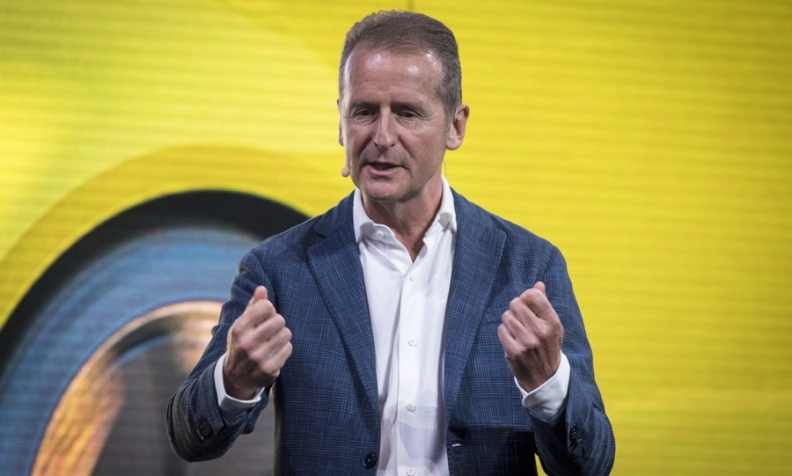 BERLIN -- Herbert Diess will take over from Matthias Mueller as CEO of the Volkswagen Group, adding fresh impetus to the company's efforts to slim down and reorganize the way its 12 brands are managed. The automaker said it will create six new business areas and a special portfolio for China, its largest market, and split its brands into three new vehicle groups with categories for value, premium and super-premium nameplates. The announcement was made after Volkswagen directors ousted Mueller and deliberated ways to reform an empire which has motorcycle, bus, truck and passenger-car brands including Ducati, Bentley, Porsche, Audi, Scania and Skoda. VW replaced Mueller after he failed to refocus the group's portfolio of car brands, a key pillar of the company's Strategy 2025 plan that is supposed to transform the company into a leader in cleaner cars after the diesel-emissions cheating scandal of 2015. Diess, the current head of VW’s namesake brand, will also oversee VW Group r&d and information technology, the company said. Mueller, who has held the CEO post for less than three years, is stepping down immediately. Diess’s appointment will be key to reassuring investors that the highly centralized German industrial behemoth is determined to reform itself. Excessive spending and poor budget discipline were eroding profit margins even before the automaker’s diesel scandal erupted. His tenure will be judged early on by whether he can scale up a revamp of the VW nameplate to the entire 12-brand group and prepare for an era of battery-powered and autonomous vehicles. The former BMW Group executive, who joined VW just a few months before the emissions violations came to light, pledged from the beginning to pursue new technology while reining in spending growth. That project became much more urgent as the diesel scandal generated massive costs, and meant taking on established interest groups. Bernd Osterloh, the company’s powerful labor leader, balked at negotiating with him during tough contract talks in 2016, but Diess prevailed with a landmark deal that paved the way to cutting as many as 30,000 jobs and saving 3.7 billion euros ($4.6 billion). "My most important task will now be to join with our management team and our Group workforce in consistently pursuing and pushing forward our evolution into a profitable, world-leading provider of sustainable mobility," Diess said in the statement. Although specific details of VW Group’s new senior management roles won’t be available until Friday, the company did make some things clear. Rupert Stadler, the embattled head of Audi, was given responsibility for sales for the entire Volkswagen Group, while Oliver Blume, head of Porsche, was put in charge of group production and will join the group’s management board, the company said. VW is also making a change in its purchasing operations. The company said Francisco Javier Garcia Sanz, its head of procurement, is leaving the company "at his own request." Sanz played a pivotal role as the automaker wound its way through the diesel emissions violations. He is to be replaced, at least temporarily, by Ralf Brandstaetter, who oversaw procurement for the Volkswagen brand, the company said. Other appointments announced Thursday by the automaker include Gunnar Kilian, from the company’s works council, as group head of human resources, succeeding Karlheinz Blessing, who will be available as a consultant until his contract expires. As head of purchasing at BMW, Diess was instrumental in the luxury brand’s ability to weather the financial crisis by squeezing more than 4 billion euros out of supply costs. He then took charge of development, but was ultimately passed over for the CEO job, when the company picked Harald Krueger in December 2014. That spurred his move to Volkswagen. The appointment of Diess was cheered by analysts. "Diess is a man of action. He is the most plausible choice at VW to lead the group into the next phase of its transformation," said Nord LB analyst Frank Schwope.